Our friend Jim Gilbert from Curating L.A. has posted a lovely article promoting the Enso Quartet’s upcoming April 17th performance at the Clark Library! Information on how to join the lottery for this performance is at Curating L.A. and on the website of the Center for 17th- and 18th-century Studies. 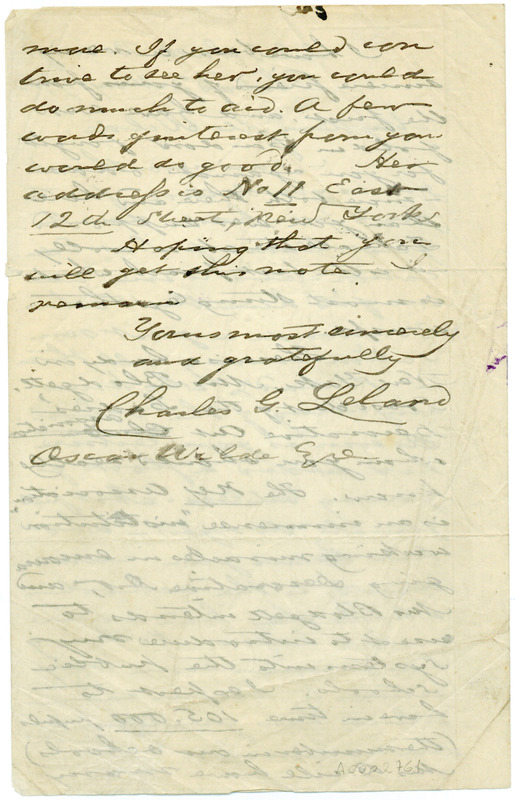 The Clark recently acquired a letter to Oscar Wilde from Charles Godfrey Leland, American author, arts educator and folklorist, written during Wilde’s North American tour in 1882. Leland (1824-1903), the founder of the Public Industrial Art School of Philadelphia, was writing to Wilde to thank him for discussing the school during a recent lecture, in which he held up institutions like Leland’s as the ideal for creating future artisans and craftspeople. "I can never thank you as you deserve for the good you have done to the Great Cause of Art Education -- and to me as one of its humble teachers." You made a great sensation among all those in Philad[elphi]a who knew anything of the school. As soon as your lecture had ended a flock of young artless-Artfull female dodgers — who had heard you came directly to the school which they had never visitied before. Nothing has occurred since my return to America which has gratified me as much. Born in Philadelphia in 1824, Leland had a widely varied and extremely interesting life and career. After attending Princeton, he studied in Heidelberg, Munich and Paris, where he constructed barricades and fought in the streets during the 1848 revolution. Returning to the US soon after, he worked for a short time as a lawyer before embarking on a career as a journalist at several national periodicals. In 1857, he published the first of his “Hans Breitmann” poems, humorous works written in broken English and German for which he became quite well-known. Leland also became increasingly involved the abolitionist cause in the years preceding American Civil War and coined the term “emancipation” as an alternative to the word “abolition.” After serving with the Union army, he became increasingly interested in folklore, folk dialects and the occult and traveled widely throughout North America studying and living with native groups. In 1870, he moved to England in order to further study the Roma (Gypsy) people, their languages and culture. While in England, he came under the influence of William Morris and the English Arts & Crafts movement, and opened the Public Industrial Art School in 1881, after his 1879 return to the US. Originally intended to teach decorative arts and crafts to underprivileged children, the school became much more well-known after Wilde’s lecture, as the above quote from Leland attests. In the 1870s and 1880s Leland also co-authored several works on art and art education. In 1883, Leland returned to Britain to further study the Roma and the Irish Travellers, and later moved to Italy, where he studied Italian witchcraft and folklore, publishing multiple works on all of these topics. He died in Florence in 1903. "Hoping that you will get this note, remain yours most sincerely and gratefully..."
When I showed them the brass work and the pretty bowl of wood with the bright arabesques at New York they applauded to the echo, and I have received so many letters about it and congratulations that your school will be known and honoured everywhere, and you yourself recognised and honoured as one of the great pioneers and leaders of the art of the future. This letter is a lovely addition not just to our Oscar Wilde collections, but to our collections related to William Morris and the decorative arts communities in the late 19th century. 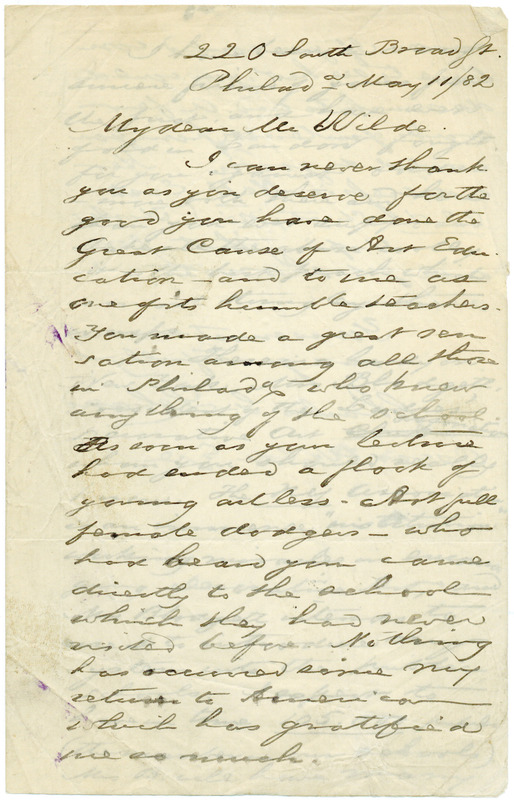 Charles Godfrey Leland, Letter, 1882 May 11, Philadelphia, to Oscar Wilde. ba MS.2011.001. William Andrews Clark Memorial Library, University of California, Los Angeles. Just in time for Valentine’s Day, the Clark has acquired a very rare chapbook published by George Smeeton, entitled “The Lover, or Cupid’s Mirror.” Chapbooks were small, cheap booklets that dispensed writings that were political, religious, poetical, literature or popular to the general public. Because they were so cheap to make and distribute, not many have survived. This is one of only two Smeeton Valentine’s to be recorded in the major on-line library systems, and the only recorded Valentine with this exact title. George Smeeton was a prolific printer from between 1800 to 1830, and produced a “Valentine” every year. He was also well known for his printings on both scandal and true crime. 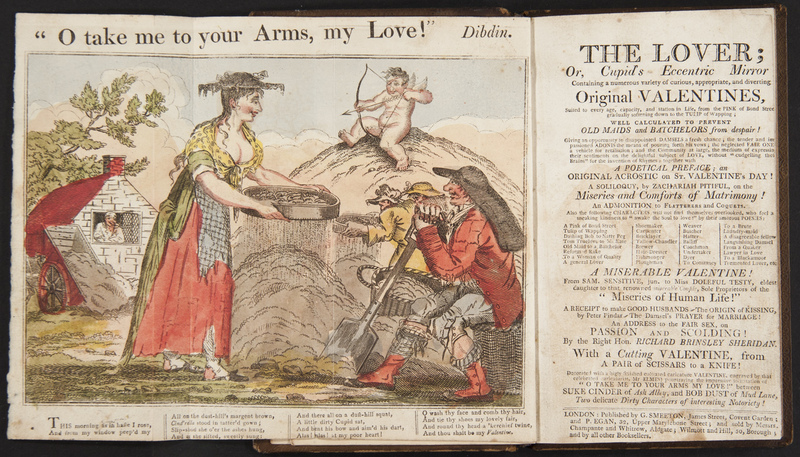 The book contains 59 humorous and sometimes ribald Valentine poems, as well as an illustrated fold-out frontispiece depicting Cupid with his famous arrows. The illustration and the text are both unsigned; the only name associated with the work is George Smeeton. The lover, or, Cupid’s eccentric mirror, containing a numerous variety of curious, appropriate, and diverting original valentines… London: G. Smeeton and P. Egan, [bef. 1810]. William Andrews Clark Memorial Library, UCLA. From Library Assistant Jessica Smith. Item of the Week: Oscar Wilde, Private Detective? Oscar Wilde is remembered for many things, his writing, his poetry, and his infamous trial for gross indecency in 1895. But what few remember are his crime-solving exploits with Sir Arthur Conan Doyle. 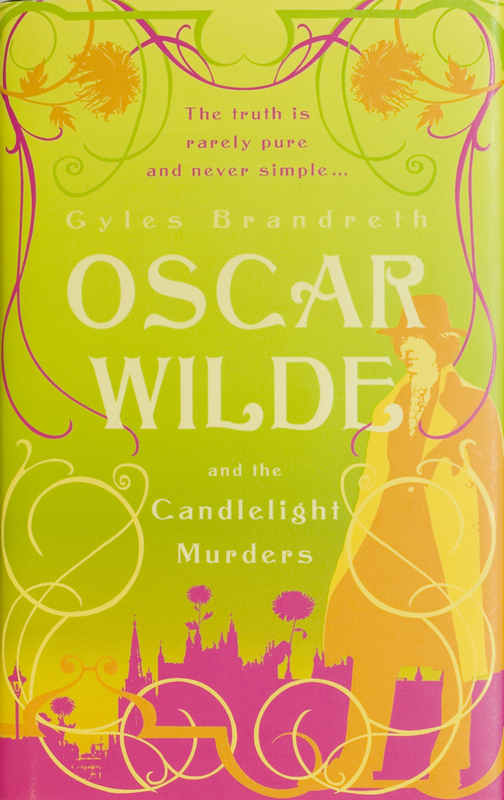 Although Wilde was (as far as historians can tell) never an actual sleuth, he plays one in three new novels by Gyles Brandreth. Set in London beginning in 1889, Wilde and his sidekick Doyle (in a nod to actual history, the pair had met that same year, according to Doyle’s autobiography) take on a series of brutal murders which stump detectives at Scotland Yard. In book 1, entitled Oscar Wilde and the Candlelight Murders (UK) or Oscar Wilde and a Death of No Importance (USA), Wilde and Doyle attempt to solve the murder of sixteen-year-old Billy Wood, a murder which could reveal itself to be a deadly cult ritual. In book 2, entitled Oscar Wilde and the Ring of Death (UK) or Oscar Wilde and a Game Called Murder (USA), Wilde and Doyle attend a dinner party including such literary luminaries as Bram Stoker and Robert Sherard. Wilde proposes a dinner game wherein everyone writes down who they would most like to murder, if they were unable to be caught. It seems innocent, until the first named victim turns up dead the very next day. In book 3, Oscar Wilde and the Dead Man’s Smile (UK & USA), Wilde travels to Paris to collaborate with theater manager Edmond La Grange and Sarah Bernhardt. Several murders lead him directly to the heart of the La Grange Theater Company, putting both his life and reputation in mortal danger. The author has been praised for his thorough knowledge of Wilde’s persona and mannerisms. The Sunday Express writes that “Brandreth also gives his hero speeches of great beauty and wisdom and humanity.” The Sunday Times agrees, writing that “the rattlingly elegant dialogue is peppered with witticisms uttered well before he ever thought of putting them into his plays.” Others praise the addition of treats for fans of Sherlock Holmes, as Brandreth intimates that Wilde was in fact an inspiration for the famous literary detective. Wilde himself wrote, “All but two of my five names have already been thrown overboard. In time, I shall discard another. A century from now, my friends will call me Oscar; my enemies will call me Wilde.” Brandreth appears to have added another moniker to Wilde, that of star literary detective. Fans of Brandreth can expect several more books in the series, as it is planned to contain as many as 9. The Clark currently holds the first three volumes. From Jessica Smith, Reading Room Assistant. The Clark’s Paul Landacre Archive is highlighted in a new post today on KCET’s SoCal Focus blog! This post and others like it, written by USC’s Nathan Masters, are part of a new collaboration between LA as Subject, a local group of which we are a part, and KCET, a local non-profit television channel (formerly our area PBS station, but now independent). 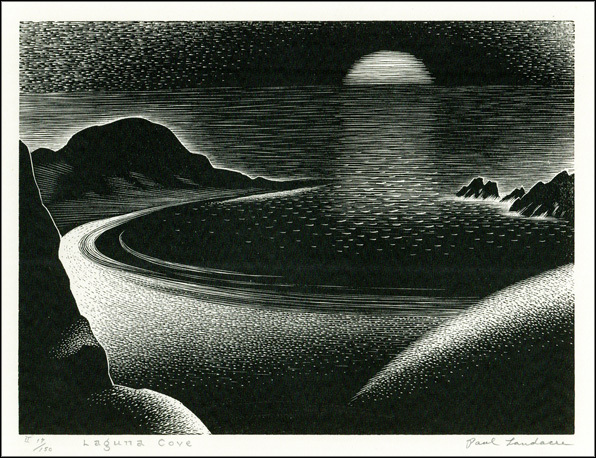 Paul Landacre, Laguna Cove, 1935. Welcome to the Clog -- the place to get updates about newly processed collections, new acquisitions and special events at the Clark Library!